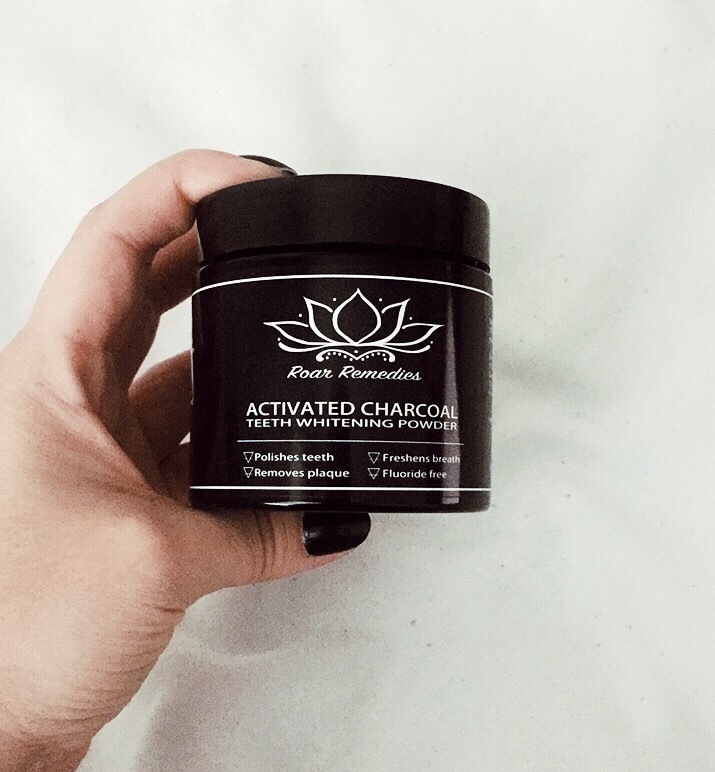 I have seen similar products to this all over social media with celebrities, bloggers and vloggers posting about their beautiful white teeth, so I was super excited when Roar Remedies approached me to try out their product – an activated charcoal teeth whitening powder. I have very sensitive teeth which is something I have suffered with for a long time now so the main question when I was asked to do this review was, is it safe? I had a dentist appointment coming up so I thought it was a great opportunity to take my Roar Remedies tub with me to double check that it would be ok for me to use before hand. My dentist said it would be fine to use and would be safe, however to carry on using my own toothpaste as well, as the charcoal powder is fluoride free. So I took his advice and for the past four weeks I have been brushing my teeth with Roar Remedies and then using my own toothpaste afterwards. The brand is based in the UK and you can find their teeth whitening products and bamboo toothbrushes, which together are perfect for a gift, right here at Roar Remedies. I am super happy that Roar Remedies contacted me to review their product. At first I was quite nervous with it being my teeth (haha) however, over the past 4 weeks I really have noticed a difference and they are definitely whiter. Even my fiancé is jumping on the band wagon and trying it out! Also just to point out that it lasts ages so it really is a good investment. Although I was asked to review this product, as always my opinion is 100% my own.